Lately, there have been growing concerns about Nigeria's rising debt profile. The issue has also elicited debate in the country. To this end, a former Deputy Governor of the Central Bank of Nigeria (CBN), Professor Kingsley Moghalu, who last week gave voice to the debate, advised the federal government to put a stop to further foreign borrowing. 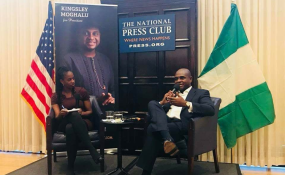 According to Moghalu, the increased foreign borrowing which the government raised in the past three years has put the country "back into a debt trap that will weigh down the future generations of Nigeria." Also, one of the leading global rating agencies, Standard and Poor's (S&P) recently cautioned the country about its rising debt profile, which has led to a rise in its debt service cost. "General government debt-servicing costs as a percentage of revenues are high and have increased in recent years from below 10 per cent in 2014 to our projection of over 20 per cent on average, in 2018-2021. "The central government alone has debt servicing costs of close to 50 per cent of revenues, which in our opinion, limits fiscal flexibility. The steep increase in the ratio is due to a combination of declining oil revenues since 2014 and higher borrowing costs in the domestic market," the agency stated. Nigeria's external debt rose to $18.91 billion (N5.787 trillion) as at the end of December 2017, while domestic debt rose to N15.937 trillion, bringing the total debt stock of the country to N21.725 trillion ($70.92 billion), latest data released by the Debt Management Office (DMO) had shown. Available National Bureau of Statistics (NBS) data had revealed that over 90 per cent of government revenues were channelled toward debt servicing between January and June last year. Nonetheless, in order to reduce the huge debt service cost, there has been concerted effort to increase the ratio of foreign, dollar-serviced debt to local debt. To this end, last year, President Muhammadu Buhari further got approval from the Senate for US$5.5 billion of foreign borrowing, with US$3 billion raised in November and US$2.5 billion issued in February. According to the DMO, the $3 billion Eurobond issue used in refinancing maturing domestic debt resulted in an annual savings of about N81.66 billion in debt service as the Eurobond was secured at about seven percent interest rate, compared to about 15 or 16 per centinterest on domestic borrowings. "In our view, the government's strategy of refinancing local loans with increased foreign loans should ease pressure on revenues for as long as there is no depreciation of the naira, should there be a significant weakening of the naira against the dollar however, the country may find itself in a bad situation," analysts at CSL Stockbrokers Limited stated. Also, the Director, Portfolio Management, DMO, Dele Afolabi defended the increased foreign borrowing by the government, saying the funds were being utilised for infrastructure development. He explained: "Borrowing on its own is not a bad thing. Through borrowing, the country has been able to do a lot of things. "We have finance infrastructure. So, to say we shouldn't borrow, I don't agree with that. You can borrow and use for developmental projects. "Currently, we are refinancing domestic debts with external loans. We have brought down cost of domestic borrowing and ultimately the cost of servicing these debts will reduce."